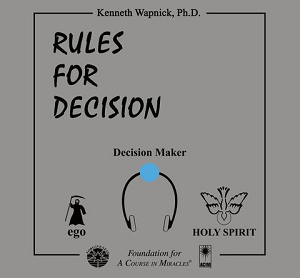 The tape set "Rules for Decision" was originally a workshop held at the Foundation's Academy and Retreat Center in September 1993. The workshop consisted of a line-by-line discussion of the section of that name in Chapter 30 of the text. What follows are excerpts from the transcribed audio tapes, which will present the basic themes of that workshop. This first part is an overview of the thought system of A Course in Miracleswhich began the workshop.